Flashing Hair Braid for, well, we’re not sure. Most women (including yours truly) spend thousands of dollars a year on hair care. Shampoos, conditioners, serums, waxes, pastes, gels, mousses and hairsprays used to clean, soften and style. We spend countless hours drying and straightening and curling and fluffing up our hair. We spend upwards of $50 for just a haircut – and don’t get me started about the cost of a foil! We buy trinkets and baubles to put in our hair after spending those thousands – clips, barrettes, pins and so on. However, there’s one thing that I’ve never spent a dime on…hair extensions. Sure, most women have had some sort of fake hair extension at one time or another, whether it be a permanent weave or just a temporary clip in type, but there’s never been a niche market for fake hair extension braids that light up. Seriously, it’s never come up. 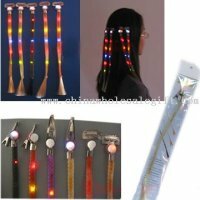 Well, somebody thought that there was a need in the marketplace for some light-up hair braids, so they designed some. Called the Flashing Hair Braid…it’s basically a clip with some very unrealistic looking hair braided together with some flashing lights. It doesn’t make weird sounds, it doesn’t hide a bottle opener or anything like that. Just a hair braid with some flashy lights. I’m not sure the practical usage of this particular item other than perhaps at Halloween or at a rave.